After posting those lovely tissue knits who knows how long ago, I finally have something acceptable to show for my troubles. I’ve made three knit garments now, and they are looking less and less like they’ll fall apart in the wash with every attempt. 1. Tissue Vita Top. It was probably over ambitious of me to use a super light tissue knit without any sort of serger on hand, but hey, I went there on my first try. I did about a million test swatches of different stitches and finally ended up using the least wonky one on most of the hems. The side ties both got caught in the feed dogs and sort of sucked under, and I had to keep yanking them out–chalk it up to user error. 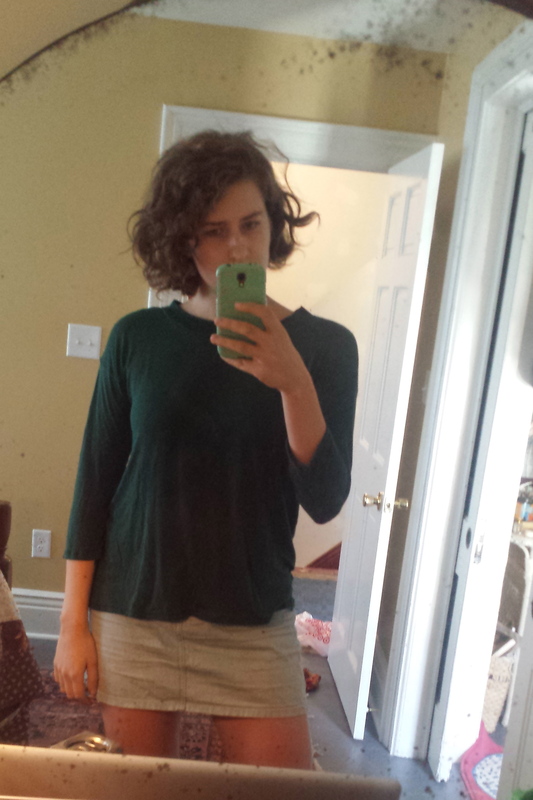 The hems are all quite ruffly and the side tie never sits right, but this is a great summer lounging shirt, and if I size up and/or use a heavier fabric the next time I make this, I think it has great potential. 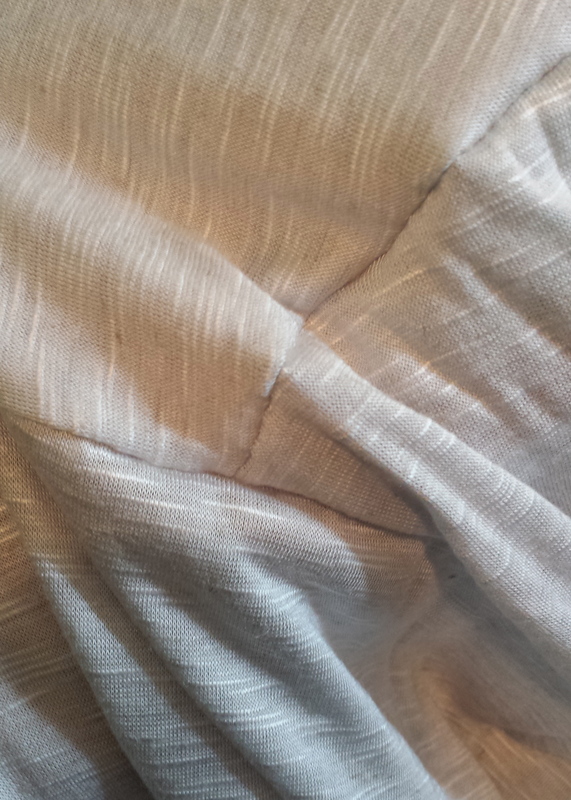 No closeups on this one because the seams and hems are brutal. I am truly surprised that this has survived the washing machine as many times as it has. 2. Green polyester Hemlock Tee. 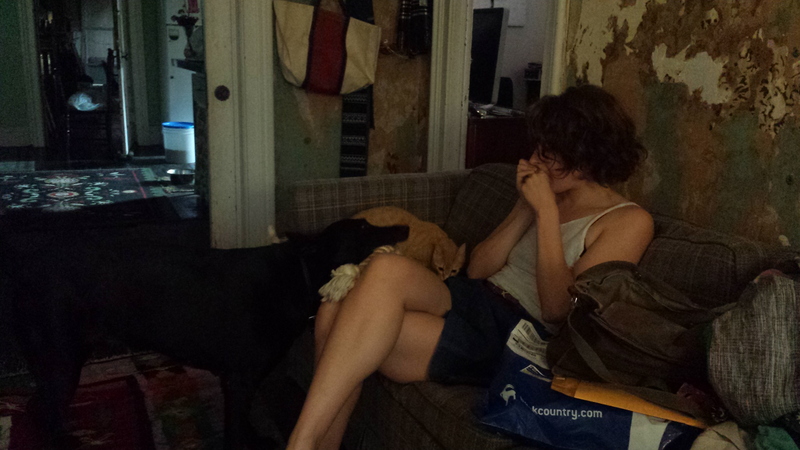 I wised up after my first try and decided to get a cheap polyester knit to play around with instead of sacrificing any more beautiful soft tissue fabric to the Feed Dog. I had some more problems with the light weight of this fabric, so after two very ruffle sleeve hems I put some stay tape in the bottom. 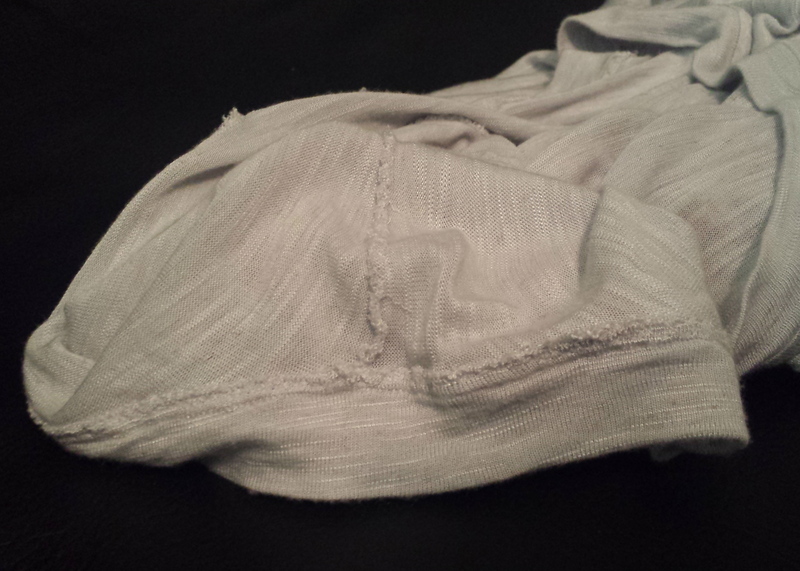 The result is a loss of stretchiness in the bottom hem, but from the outside it looks a lot better. Tradeoffs, right? 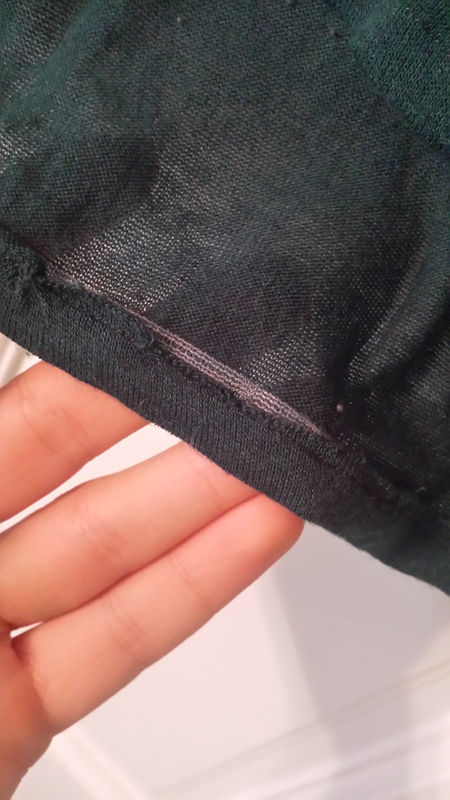 It also would have helped immensely if I had read the instructions; I sort of skimmed over them and ended up setting in the sleeve instead of overlocking all the way down from the sleeve to the bottom hem. The collar shows a bit of overlocking and the fabric is Not of the Finest, but I really like this shirt and foresee wearing it a lot as the weather gets chillier. 3. 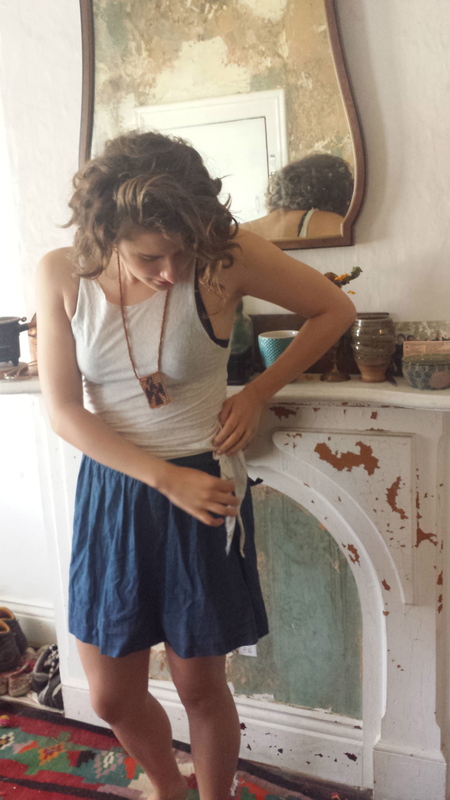 Gray linen-silk Hemlock Tee. I’m super proud of this iteration because pretty much everything turned out the way I wanted it to. Some back story: I made this as a gift for my friend’s birthday. We have an inside joke about tigers and T-shirts, and naturally, the logical conclusion was that I had to make a tiger T-shirt to give to her. Initially, I wanted to make a shirt with tiger print sleeves, but I decided that that would be, as Tim Gunn says, “a whole lot of look”; I wanted to make her a versatile shirt that she would actually want to wear. I found a tiger print from Andrea Lauren on Spoonflower and order a sample of it in Organic Cotton Knit, thinking I would make a pocket out of it. 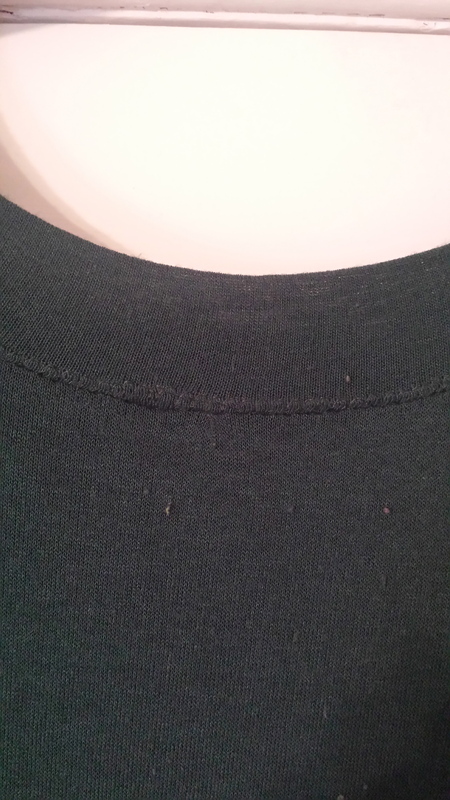 the joys of the overlock stitch! 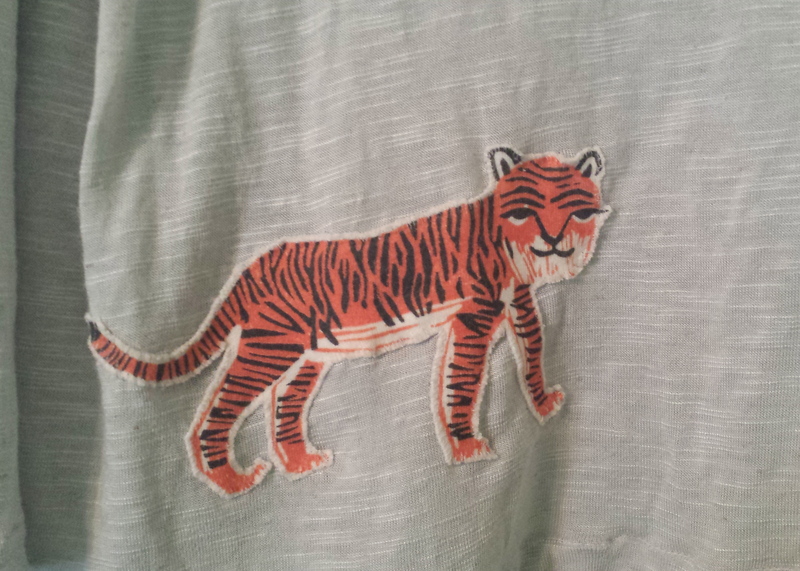 After the shirt was sewn up, it was time to incorporate the tigers. 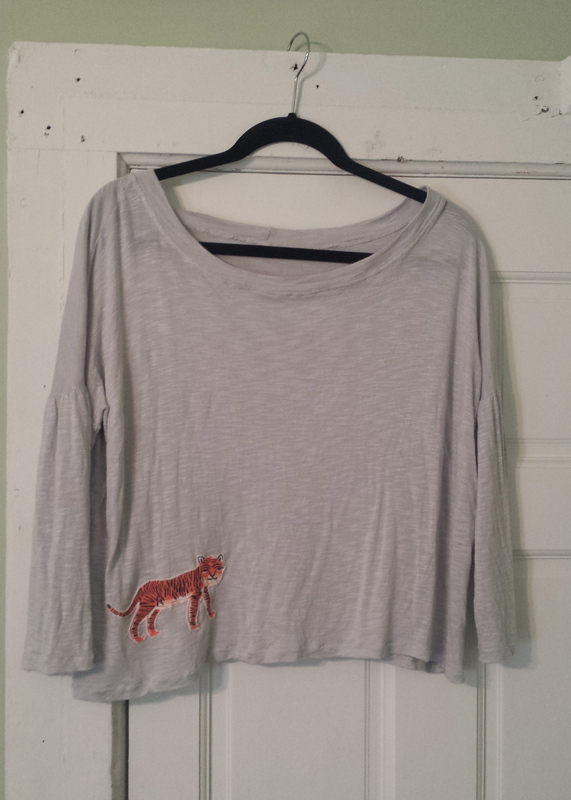 I realized that the Spoonflower knit was a bit too heavy to be a viable, good-looking pocket on such a light fabric, so I ultimately decided to cut out a tiger and applique it onto the shirt. 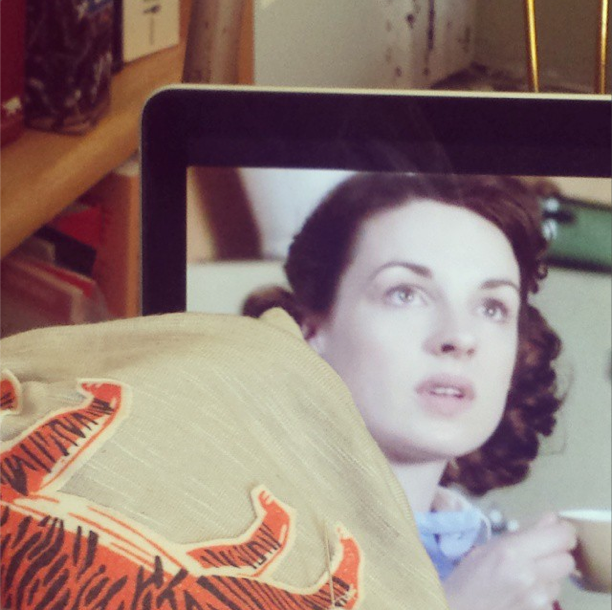 This portion of the post made possible by Call the Midwife and a comfy, comfy chair. The tiger cutout had the tendency to stretch out and distort, so I used some water-soluble tape to make sure all the limbs stayed in place while I was working. After three episodes of Call the Midwife and what felt like a billion hours later, the applique was done. And there we have it: a cute, personalized shirt that I’m super excited to send my friend. Now that I am a bit more confident handling knits, I’m thinking about what else to make. Next up, though, I’m going back to wovens for a few Phryne Fisher-inspired fall pieces. This entry was posted in Sewing Projects, Shirts and blouses and tagged grainline studio, indie patterns, knits, named clothing, shirts, why did i think this fabric was a good idea again?. Bookmark the permalink.